We complicate Horsemanship. There are so many rules and pieces of advice we hear. Sometimes when we try to follow every bit of advice or rule…we make riding and enjoying our horses so complicated that we forget to actually ride, have fun, and enjoy our time on horseback with our four legged friend. Here are my five rules for Simple (and great) Horsemanship. #1 — Be a Healthy Rider. I do not mean have the perfect weight or Body Mass Index….I mean be in good health. Good health means that you can breathe fairly well, you have had a decent amount of rest, and you are eating sufficiently that you have energy and stamina. There are times when our health is not perfect…we might still be able to ride but must ask ourselves this question first — am I in good enough health to take care of my horse and keep him/her safe.For those with health issues that are not going away in the immediate future, therapeutic riding programs can help you have safe riding experiences. Ride with people who are going to be able to keep you safe and most especially — keep the horse safe. #2 — Ride a Healthy Horse. A horse, just like a person, can have days when it is not feeling well. Those are days that we should give the horse off from work. If we want to spend time with our horse, maybe go for a walk with him/her on the halter and just take in the scenery. I cringe when I hear people give me a list of medications their horse is taking. Supplements are one thing …. A pill for the foot problem, another medication for the ear issue, another for the hock that is swollen, and still another for the back soreness….. ENOUGH ALREADY! Work with your equine wellness professional and help your horse get healthy to ride. To many times I have seen a horse not quite healthy be ridden and before I know it – there is another issue, then another issue, and then another issue. People scurry around just trying to take care of each added issue. Stop and get the first issue taken care of and you will be able to ride and not have to worry about another ailment or lameness. #3 — Have a Riding Plan. I hear quite often people discuss a riding disaster. When they finally stop telling the story, I ask them what their plan was for the ride. Most often I get one of two answers 1) I had no plan, or 2) I planned for a nice ride but my horse looked sideways and I decided right then and there we needed to work. Okay — the no plan is a problem since the rider has not done mental preparation and I can tell you from experience that the horse knows this and the horse is always working to help us be more honest with ourselves. The fix it right there and then plan — I know we all need to do this. We just need to have some ideas already in our head as to how we might deal with an issue (I will cover this in a subsequent blog). Suffice it to say, when we “decide right then and there we need to work on an issue” we most often jump into that training situation without thinking if we have all the tools necessary to complete this training. We also jump in with our emotions and from what I have learned in my life – learning or teaching when I am emotional does not yield good results. Your plan can be detailed or it can be simple … I like the simple idea and will discuss this soon in another blog. #4 — Be Safe. Always Always Always think safety first. Protect your health and that of your horse by being safe. Sure — the ride down the mountain in the Snowy River Movie was amazing but not all of us or our horses are prepared for that ride. Think about the road/arena conditions, weather forecast, horse leg protection, rider personal protection. They key here is that if you get hurt – you cannot keep your horse safe. Be a safe rider and this lets you take care of your horse. #5 — Listen to the Horse. The key to great riding is developing your ability to listen to what your horse is telling you. When we listen to the horse we find that the horse is asking us simple questions…the horse is asking for guidance. The horse understands fight or flight and pressure and release. 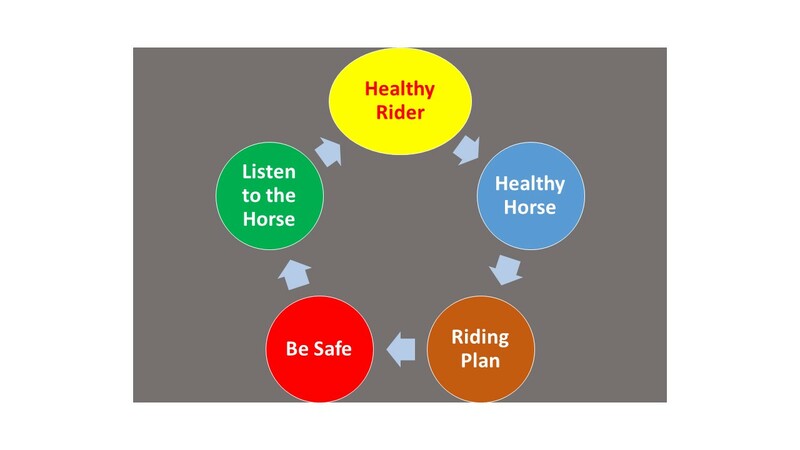 These are relatively simple concepts and we use them in our training to establish trust and confidence in the horse for the rider. It is only the horses opinion of what I’m doing that has value to me, and that can change in an instant so I must always be listening and answering with quiet aids and guidance. Horsemanship, riding horses, raising horses, coaching riders, spending time in the barn — these things are what I enjoy doing. When I keep my life simple (some days it is a struggle) — I find I am happy, my health is good, my horses are healthy and happy, and I experience some of the greatest rides in life. I have my horses to thank for helping me to understand that simple horsemanship is balanced and rewarding horsemanship.